[Image: Ladder leading down to a U.S.-Mexico border tunnel; photo by Monica Almeida for The New York Times]. It's a bit late to be posting this – the deadline is tomorrow – but there's a great call for papers going around right now for something called "Under the West." Hosted down at the Huntington Library, "Under the West" will be "a scholarly workshop examining the history of the subterranean American West... Topics or themes might include archeology, mining, hydrology, geology, seismology, the history of cemeteries or burials, etc." The actual conference takes place May 17, 2008. This obviously cuts things a bit close – but if you're on steroids and you think you can hack out an application in the next 24 hours, I say go for it. Tell them you read about it on BLDGBLOG. 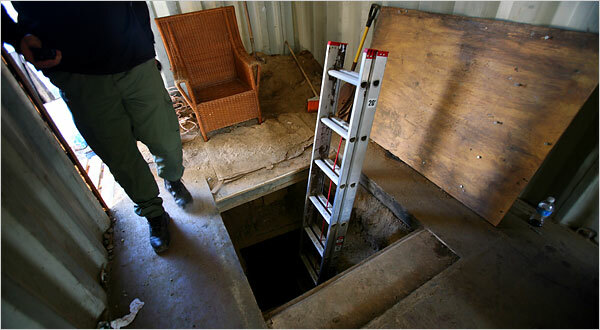 For some possible inspiration, meanwhile, check out a recent article in The New York Times: "Smugglers Build an Underground World," where we read about border tunnels along the U.S.-Mexico border. 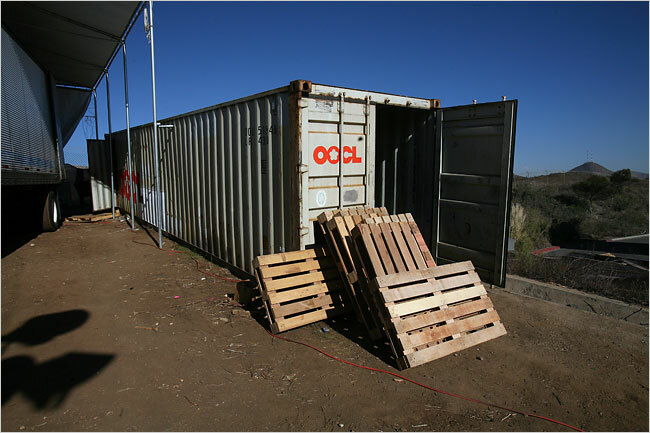 The tunnel opening cut into the floor of a shipping container here drops three levels, each accessible by ladders, first a metal one and then two others fashioned from wood pallets. The tunnel stretches 1,300 feet to the south, crossing the Mexican border some 50 feet below ground and proceeding to a sky-blue office building in sight of the steel-plated border fence. Three or four feet wide and six feet high, the passageway is illuminated by compact fluorescent bulbs (wired to the Mexican side), supported by carefully placed wooden beams and kept dry by two pumps. The neatly squared walls, carved through solid rock, bear the signs of engineering skill and professional drilling tools. 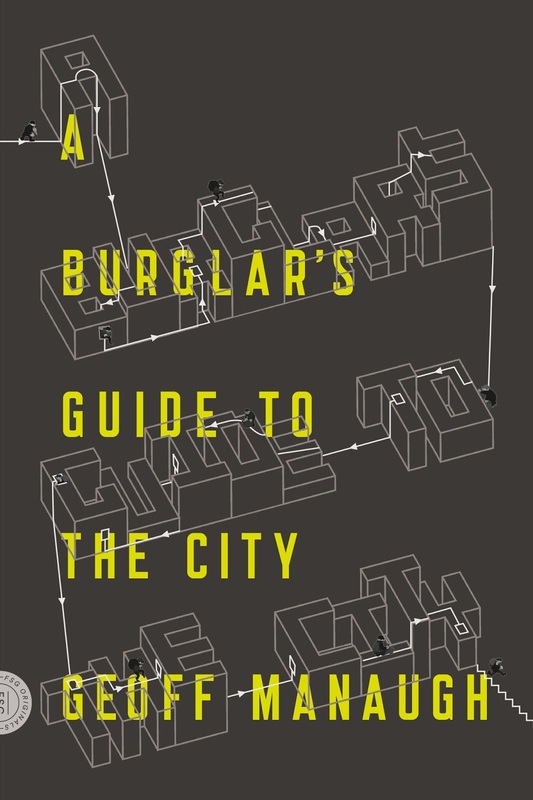 It's the subterranean DIY architecture of armed black-market libertarianism. 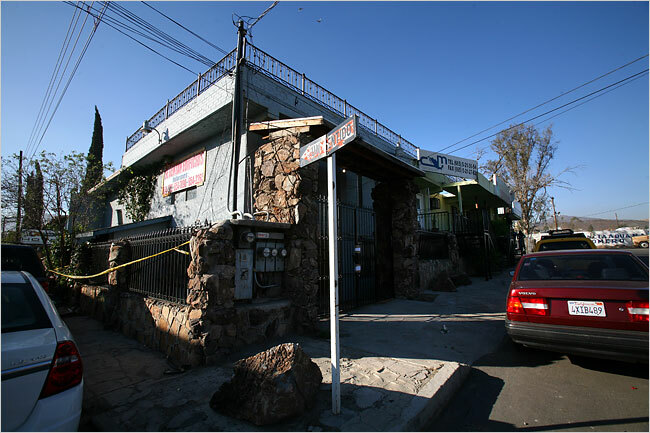 [Images: A tunnel inside this U.S. shipping container (top) goes down, under the U.S.-Mexico border, and comes up inside this Mexican storefront (bottom). Photos by Monica Almeida for The New York Times]. If we no longer live in an era of architectural postmodernism, then, and especially not in the age of deconstruction, with all of that movement's chest-beating male hysteria, perhaps one might say that we've entered the weird and porous world of narco-spatiality: the earth itself made hollow and perfect for smuggling. Illegal topologies worm their way through the soils of Westphalian sovereignty, as nation-states stand, insecure, over unregistered excavations in the desert, territories sewn one to the other like points on Klein bottles: a new form of economic and political adjacency with no true government in sight. Most of the tunnels are of the “gopher” variety, dug quickly and probably by small-time smugglers who may be engaged in moving either people or limited amounts of drugs across the border. But more than a dozen have been fairly elaborate affairs like this one, with lighting, drainage, ventilation, pulleys for moving loads and other features that point to big spending by drug cartels. Engineers have clearly been consulted in the construction of these detailed corridors. All of which brings us back to the conference at the Huntington. 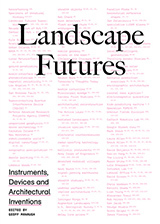 That title – "Under the West" – perhaps even takes on metaphoric status here; in other words, beneath traditional concepts of territory, sovereignty, governance, law, and even constitutionality – that is, under the West – we find this literal border world of inverted self-connectedness, an unpoliceable terrain of infinite porosity, underground. It's criminal space, excess space, space that exists outside the Law's capacity to grasp. Space that bulges. As a San Diego-based Immigration and Customs Enforcement agent explains to the New York Times, trying to control this world is "like squeezing a balloon." Of course, one could also say that it is criminal space only insofar as we have made it illegal. Until that point – until the tripwires of Law get snagged and legislation clicks into gear and superior courts all grind into motion – it's just a bunch of holes in the desert. What form of government is appropriate for this terrain? You close down one tunnel and another appears two miles away, days later. How does one wrap sovereignty around a surface that constantly moves? When your state is mobile, can the State be a relevant institution? In any case, for more on border tunnels see Bryan Finoki's ongoing catalog of this Kafka-like space: Orwellian Wormholes and On Border Tunnel Infill, among many, many others. (With thanks to Alan Loomis for information about "Under the West"). Somehow it's fitting that drug smugglers are "building green" with CFL's and, by necessity, these underground "EarthShip-esque" caverns, taking benefit from the Earth's natural warmth and buffering. Yet we need Walmart and its million CFL campaign to convince US citizens to change their lightbulbs. Geologic effects of underground testing are visible from a google earth, and have caused 6.0 earthquakes with new fault zones three miles km long, moving the crust up two feet. If I had a time altering Delorean I would definitely go back 1 week make a run for submission. On a different note, it's an interesting convergence that this post, ruminating briefly on government and borders, should come just after the No Borders protests--a diverse group who believe that it's morally indefensible to let someone come from Minneapolis to work in Phoenix (~1800 mi.) but forbid the same for someone from Juarez (~430 mi.). Nationality is essentially a quirk of fate, after all. I'm pondering what you meant when you wrote "with no true government in site". It's an interesting pun. Did you mean 'in situ' or ' in sight'? The former is workable, up to a point, while the latter might be taken as a comment on the legitimacy or reality of governments. Well... truth be told, that's a typo. Sorry! I might have to change it now, rendering your comment referent-free. I meant in sight. Alas. This is only slightly related, but I'm wondering if you've read "The Mole People: Life in the Tunnels Beneath New York City". I couldn't find any reference to it using the blog's search bar, but i'd be really interested to read your responses. Its a quick read and a fascinating account (though heavily disputed) of the massive population of homeless people who were (maybe still are?) living underneath NYC in abandoned tunnels. There is also a film from 2000 documenting a small population of NYC underground homeless called Dark Days. If you've already written about these, please point me to in the right direction. Hey Doug - I haven't, actually, but this might be up your alley: Beneath the Neon, about people living in tunnels beneath Las Vegas. I've seen Dark Days; it's not bad. There was something about it that I can no longer remember that makes me hesitate to say I really liked it, but it was a memorable documentary. Thanks for the recommendation, Geoff. I'll check it out. Yes, the mole people book and the movie, Dark Days, have some problems. For me, I wasn't into the stylization of the movie with the DJ shadow soundtrack - great music, but it made film a bit too "cool". 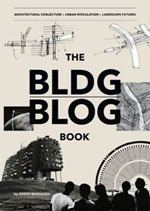 The book is too haphazard with its presentation and portrayal of the underground world. I have some links to criticism and a few "mole people" related links collected at my del.icio.us page if you're interested.